Later this year, a plant in Big Spring will become the state's first facility to process wastewater and send it back into the drinking water system. This is the ultimate use of "reclaimed water" — a source crucial to Texas' future. 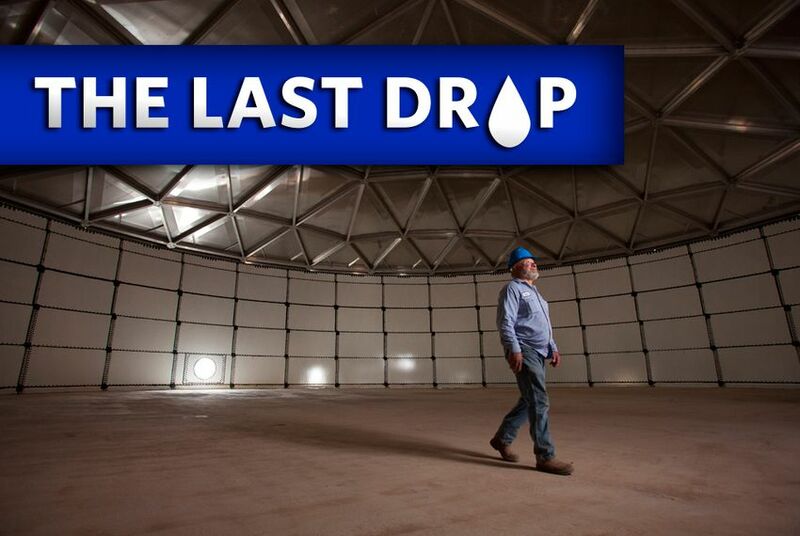 On the outskirts of the Permian Basin town of Big Spring, workers have spent the last few weeks putting a roof on a facility that will, when it begins operating this year, become perhaps the first plant in the nation to process wastewater to put into a drinking water system. Experts say such use of wastewater, a drought-proof resource, provides a key part of the water solution for fast-growing, drought-prone Texas. "Reclaimed water," the term for cleaned-up wastewater that gets reused, currently provides a little less than 3 percent of Texas' water supply, often for purposes like irrigating golf courses. The figure is projected to rise to 10 percent by 2060, according to the Texas Water Development Board. Reclaimed water "is a way to stretch our existing supplies and potentially avoid expensive infrastructure projects," said Myron Hess, the manager of the Texas water program for the National Wildlife Federation. Putting potable water on grass is especially wasteful, environmentalists say. When cities do not "reclaim" their wastewater, which is also called effluent, it generally gets dumped into creeks and rivers. Austin, for example, puts its effluent into the Colorado River, and wastewater from Dallas goes into the Trinity River (which ultimately helps supply water to Houston). To some degree, Texas has been a leader on reclaimed water. The San Antonio Water System boasts of having the "nation's largest recycled water system." Some of that recycled water flows down the San Antonio River, at the heart of the city's popular River Walk, and some goes to golf courses, parks or industry. Some smaller systems are just starting on reclaimed water, though in a less dramatic fashion. This month, College Station is expected to turn on its first reclaimed system, to irrigate soccer, baseball and softball fields at the Veterans Park & Athletics Complex. That park contains College Station's largest irrigation system, and the city's water services department plan to introduce reclaimed water into more parks, according to Jennifer Nations, College Station's water resource coordinator. Cost can be daunting for small utilities, however. The $3.3 million College Station system was a decade in the making, and Nations acknowledged that the "cost issue was definitely one of the reason it took so long to get it going." However, it made sense over the long term, she said: "It can be seen as cheaper to just keep on doing what you're doing, but that's not really a sustainable way to go." Despite the challenge, across Texas, the systems are growing fast. In Austin, reclaimed water accounted for 2.6 percent of total water use last year, according to Jason Hill, a spokesman for the Austin Water Utility, who said the reclaimed system has been growing at a rate of 5 percent to 8 percent per year. In El Paso, which gets just 10 inches of rain per year, reclaimed water accounts for 6 percent of supply, and the local water utility plans to increase that to 15 percent over the next decade. But if wastewater reuse takes off in a big way, it could spark concerns among environmentalists. The existing wastewater flows are "kind of the lifeline for our rivers and estuaries," said Hess of the National Wildlife Federation. If they dried up, the plants and animals dependent on the river could suffer, especially during drought, when no other water is flowing in. So "we just have to be careful we don't go too far," Hess said. In theory, the same issues could occur for drinking water supplies — after all, as the joke goes, Dallas' toilets keep Houston's taps running. Nations, the College Station official, said that was certainly a topic of discussion among reclaimed water experts, but she said her city would not hurt any other city by reducing its wastewater flows. That's because College Station's original water source is groundwater, so downstream cannot claim rights to it. "With groundwater, there's really nobody downstream depending on it," she said. This article is the third in a four-part series on water use in Texas in an age of drought. Part One is about cities raising water rates. Part Two is about a push toward desalination. Coming Tuesday: Conservation efforts in the state.